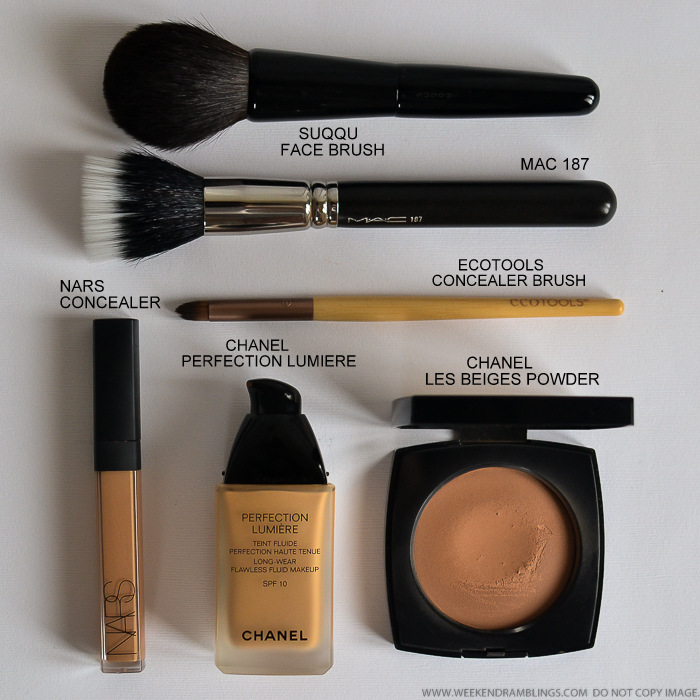 Face makeup: Foundation - Chanel Perfection Lumiere (BA34) applied using the MAC 187 brush. This brush is awesome for applying thin layers of product - I use a mix of stippling and criss-cross motions to blend in the foundation. Concealer - NARS Radiant Creamy Concealer (Caramel). It's a teeny bit dark for some parts of my face, but overall, it's a great concealer for both undereyes as well as blemishes. Blends easily with fingers, and I use an Ecotools brush for more precise placement. Lasts all day long. 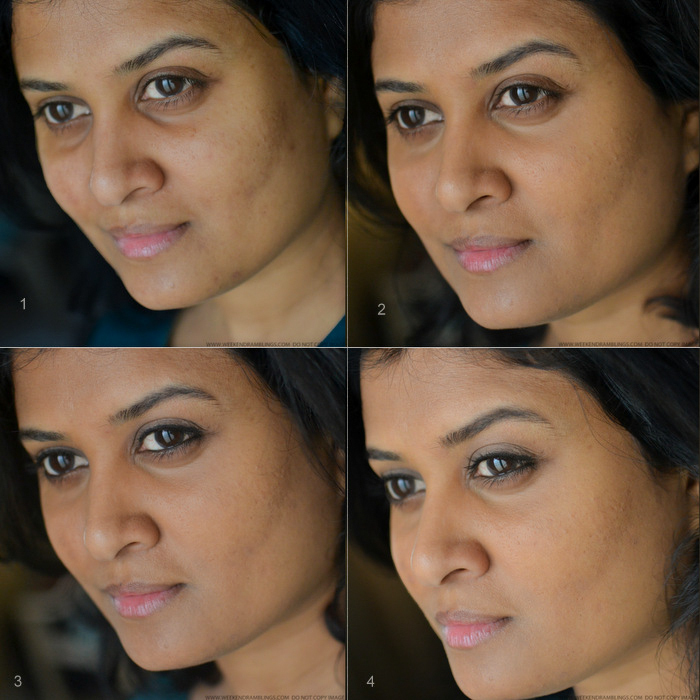 Powder - I have been using the Chanel Les Beiges powder as an all-over setting powder for a while now. It isn't ideal, but I was waiting for the Chanel Vitalumiere powder foundation to turn up and was holding off on buying another powder until then. Les Beiges can look a bit dark on my skin, especially if I get a little enthusiastic with the application. 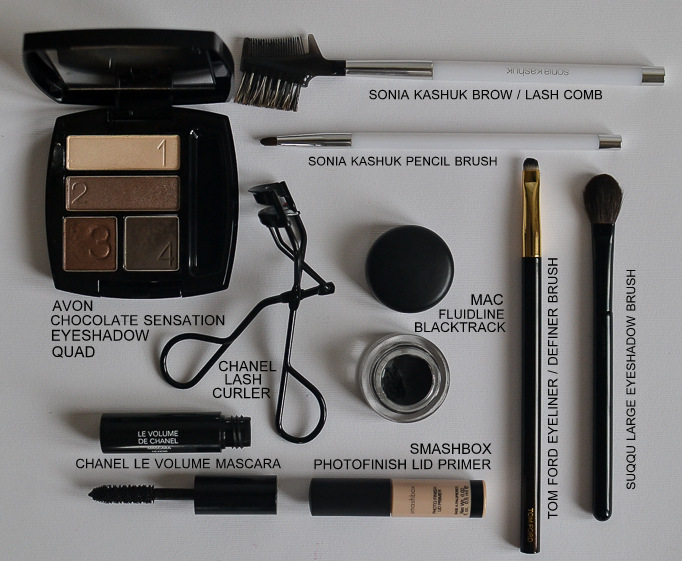 My go-to powder brush is the Suqqu Face brush. So soft and perfect for a sheer application of powder. A good base is an absolute essential for my uneven skin tone, and Chanel Perfection Lumiere has been my go-to foundation for a while now. It's perfect for my oily-combination skin and gives medium coverage with a natural finish that isn't too matte or dewy. For my undereye area as well as for concealing blemishes, I use the NARS Radiant Creamy Concealer (I use the shade Caramel). I add in YSL Touche Eclat at times, but for a basic clean face, this foundation-concealer combination works okay for me. As you can see from the photos below, just a thin layer of foundation with a bit of concealer for the blemishes makes a HUGE difference! I use Chanel Les Beiges as an all-over powder, and it can be a bit dark for me, but using a soft airy brush like the Suqqu Face brush helps put on a sheer layer. I planned this post and took these photos a while back, and I have since switched to the Chanel Vitalumiere Loose Powder Foundation (shade 50). 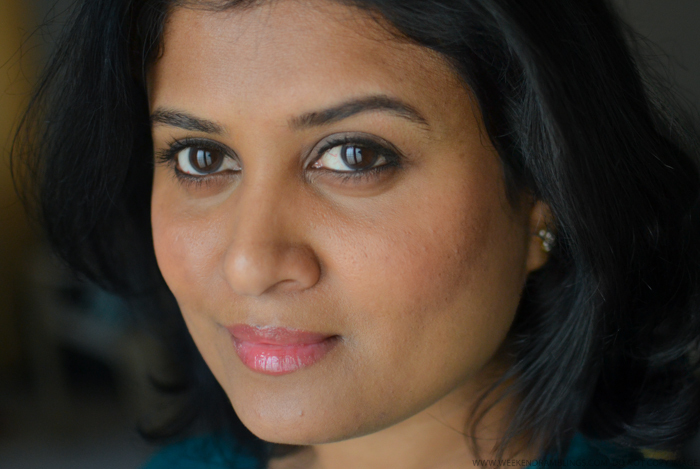 For my face makeup, what works best is layering products. I apply a thin layer of foundation and use a concealer and a small concealer brush to conceal only the blemishes and the darkness under my eyes. This helps the skin look a lot more natural, imo. 1. My nekkid scary face. 2. Applied Chanel Perfection Lumiere foundation using the MAC 187 and NARS Radiant Creamy Concealer for dark circles and over blemishes. 3. Eyeliner - MAC Fluidline Blacktrack. 4. Finished with filling in my eyebrows and a coat of mascara to define my lashes. Since spend a good chunk of time covering up the patchwork of blemishes on my face, I have to rush through the rest of my makeup. For my eyes, the quickest makeup look is brown/black liner and a good, clump-free black mascara - the last thing I need to do is poke my eyes while trying to comb out clumped lashes! I have been using Chanel's Le Volume mascara for a while now, and I must say I am getting quite addicted to it. I might have to cough up the money for a full size once I am done with the samples. 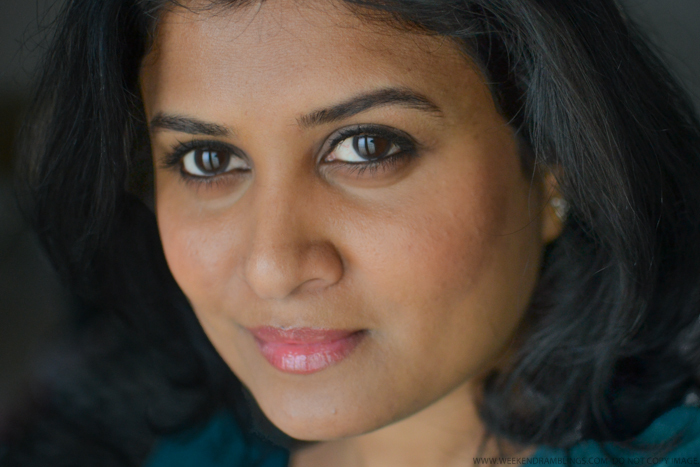 Another makeup must-do: Filling in the brows. It's something I have started doing recently and just can't seem to skip. I am still looking for a good brow color/product, but for now I use a dark matte brownish black shade from Avon Chocolate Sensation quad. Contrary to the usual makeup rules, I can get away with a black for brows (or so I think), but I have to be very careful while applying or it can go horribly wrong. Blackish-brown is much more forgiving, especially since I use a smudger/pencil brush to fill in the color and most times I only fill in the gaps. Combing through blends in the color better. Smashbox Photofinish Lid Primer - I use this over my lids even on days when I don't use any eyeshadow just to keep the lids from getting too shiny. I also dust the lids with the Les Beiges powder using the Suqqu Large shadow brush. Lash curler - Chanel. It's the first and only lash curler I have bought, and I love it. Chanel Le Volume Mascara in Black - Great for clump-free dark and defined lashes. Avon Chocolate Sensation Eyeshadow Quad - Though I keep it around mostly for the darkest matte shadow shade, this is definitely one of the best neutral eyeshadow quads I have tried so far. I could manage with just this one quad if I had to. For days when I want to add in a pop of color to this basic makeup routine, I use a brightish lipstick or blush - sometimes both. 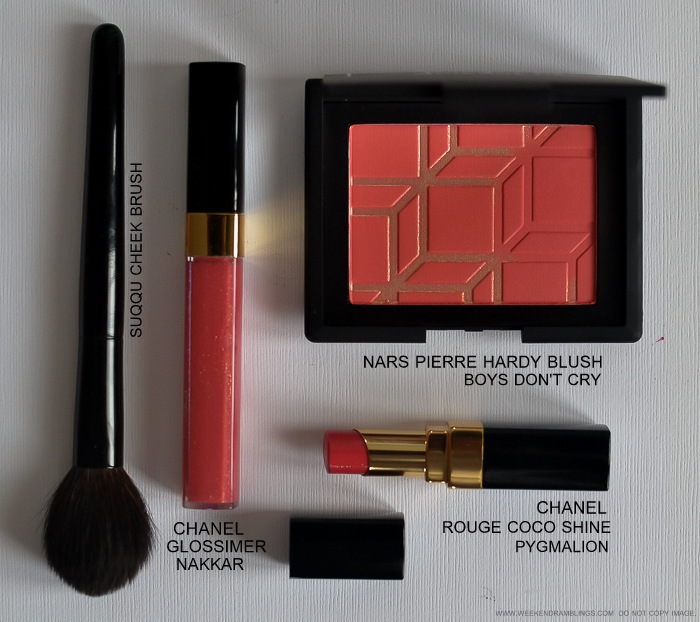 My favorites: Chanel Rouge Coco Shine in Pygmalion and NARS Boys Don't Cry. Both of these were limited edition products from a while back, and while the NARS blush is a generous size that will last me a long, long time, I really do regret not picking up a backup of Pygmalion while it was available. Rouge Coco Shines are incredibly moisturising - an essential for chronic dry lips like mine - but they don't last too long on my lips, so sometimes I layer on a lipgloss. With Pygmalion, it's usually Chanel Levres Scintillantes Glossimer in Nakkar. It's a lovely coral color with subtle gold shimmer that's barely visible on the lips and feels quite good on the lips too. My favorite products for a pop of color: NARS Boys Don't Cry blush applied with the Suqqu Cheek brush. Chanel Rouge Coco Shine in Pygmalion and Chanel Levres Scintillantes Glossimer in Nakkar. And that's my finished, easy-peasy wear-to-work look. I stay indoors, so this makeup holds up well through the day even without a primer or a setting spray. Most of the products used - especially the concealer and foundation - are longer lasting, and I only need to retouch my lip color through the day. I take the lipstick/lipgloss along with me and also some blotting paper (Shiseido Pureness Oil Control Blotting Paper) just in case I get a little too oily as the day wears on. And, lip balm. What must-have products are part of your office makeup routine? Do share! I think coral is definitely your shade! looks absolutely gorgeous on you! Hiyaa Apppu :D Thank you! Melty? OMG! Mine has been holding up well so far, but it does seem to be getting used up awfully fast..
Congratulations dear, first off! :) And u look perfect! That blush...looks really nice on u!